I don’t have to go around the town talking about my periods, but when I need to, I shouldn’t have to feel ashamed of it. I shouldn’t have to be red-faced when asking for a packet of sanitary napkins in a medical store, and the salesman shouldn’t have to hunt for a newspaper or a black plastic bag to sneak the packet in. 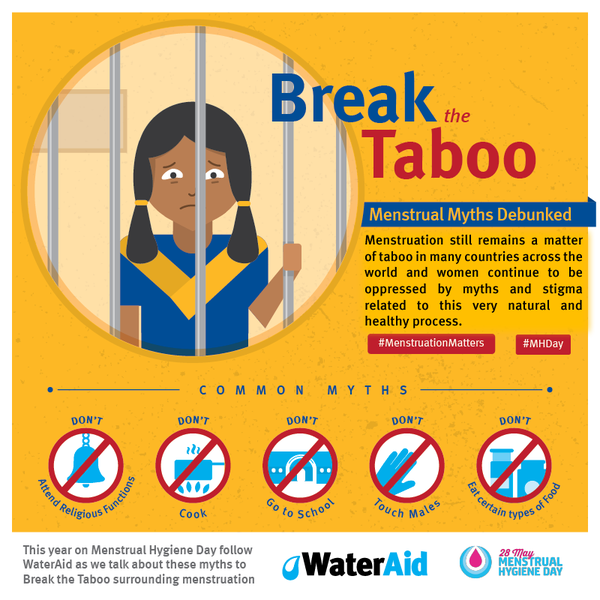 Menstrual taboos must be challenged; they must be broken. Case 1: Our maid is sincere enough to always inform us a day before taking a leave. Except, each month, she takes a day off without giving us the slightest hint. The next day when she shows up, it is invariably a fever or a cold that she cites as the excuse. It’s a five-year old ritual; so we don’t even ask anymore. In any case, we know why she didn’t turn up – she started her period, but she won’t say that even to us women. Case 2: A few months ago, I educated my 12 year old cousin on menstruation since she can have her menarche any time now. She did have a vague idea about it because most girls in her class had already been having their periods. Also, she had seen her mother take a couple of days off every month from her cooking and praying routine and had come to correlate it with the “monthly thing”. Her mother – my aunt – wanted her to know what menstruation is but felt too embarrassed to talk to her about it. Some of the commonest Menstrual Taboos. Image courtesy of WaterAid. These two real-life cases are a tiny sample of the magnitude to which menstruation is associated with shame. It is as if to menstruate is to commit a disgraceful act, which you should be keeping under wraps and be remorseful about. Things would have been “somewhat” acceptable if they stopped at just that. But as we know, they don’t. They go to the extent where the menstruating woman is banished from the kitchen, confined to some corner of the house, not allowed to touch any object or any person, prevented from worshipping, and in some communities, not allowed even to bathe or to wash her hair. And this is not even the whole list of taboos practised across the country. It is good, therefore, to see a number of organizations taking up the task of getting women, especially young girls, to talk about menstruation, and challenging the myths around it in their own ways. Whisper’s #TouchThePickle campaign is particularly noteworthy because it shows a bunch of grannies encouraging a young menstruating girl to touch a jar of pickle (another taboo). The ad went viral, with more than 2.9 million women pledging to “touch the pickle jar”, and won P&G the Glass Lion Grand Prix for gender equality. I was shocked then to see Sinu Joseph label this campaign in her article “Why India Doesn’t Need The Sanitary Napkin Revolution” as demeaning the cultural practices around menstruation as Menstrual Taboos. Sinu’s write-up starts on a positive note. She makes very convincing arguments regarding: 1. the extremely small sample size (1033 women) used to study the extent of the use of sanitary napkins in India; 2. menstruation not being the reason behind girls dropping out of school; 3. the hypocrisy of asking women to discard traditional cloths in favour of fancy cloth pads on the ground that the latter are environment-friendly; 4. India being an untapped market as the reason behind the keen interest shown in the country’s menstrual practices by foreign organizations. But her article acquires a very regressive tone when she dismisses all attempts by any organization – Indian or foreign, for-profit or non-profit – to challenge the taboos surrounding menstruation as an imposition of another’s belief system and unnecessary social engineering. or a practical one (seclusion gives privacy, space, and rest to a menstruating woman). These explanations are disturbing because they lend the taboos an impenetrable aura of wisdom and legitimize the untouchability practised against a menstruating woman. The other flaw these explications suffer from is that they are easily refutable. Ayurveda advises women against consuming pickles and yogurt during periods because they are acidic and can cause heartburn and bloating. So effectively, it is the pickle or the yogurt that has an adverse impact on the menstruating woman instead of the other way around (of which there is no evidence anyway). Likewise, menstrual blood is indeed powerful, not because it can be misused for black magic, but because it contains stem cells that can be harvested to create any kind of cells and tissues and be used to treat ailments like diabetes, rheumatoid arthritis, and Parkinson’s disease. Further, idols in a temple are kept in the garbhagriha (sanctum sanctorum), the entry to which is restricted to the priests generally. There is no question then of any exchange of energy happening between a menstruating woman and an idol. Also, and more important, there is no bar on women practising meditation – the highest form of worship – during periods. Finally, if the argument that women are isolated so as to allow them rest were true, they would be treated with respect, not with contempt fit for a criminal. Besides, not all women (I for one) experience PMS (Premenstrual syndrome) or pains, cramps, and fatigue. For us, period days are no different from the other days. Sinu defends menstrual taboos calling them a matter of personal choice. But choice exists only when there are options to choose from. Do the women have that luxury? In fact, it is choice that sets the Red Tent Movement (which again she is critical of) apart from the seclusion imposed on women in India other than in some communities like the Gollas. She says: There is something wrong about everyone deciding for the rural Indian woman, except for herself. Sure. But why be critical of people or organizations engaged in making these women aware of their options? The menstrual cloth women have been traditionally using is often the “dirtiest piece of cloth” (to quote Anshu Gupta, who started the highly-acclaimed Not Just a Piece of Cloth campaign and has won Magsaysay this year), causes discomfort and is prone to leaking. If there are low-cost, thoughtfully-designed, reusable options, why deny women the chance to become aware of them? Menstrual practices may or may not be an outcome of patriarchy, but they do oppress women. They may have had relevance in the past, but they have outlived their utility. Challenging these taboos does not in any way mean ridiculing our traditions. It just means keeping up with the times. Social change is always the fruit of the labour of diverse actors, each of whom can have their own notion of how to achieve the goal and their own intentions behind it. Companies selling sanitary napkins may want to change behaviours solely to boost their sales, but if in doing so, they are able to help women break free of constraining practices and to educate men on a biological process they tend to know little about, there is no reason to complain.